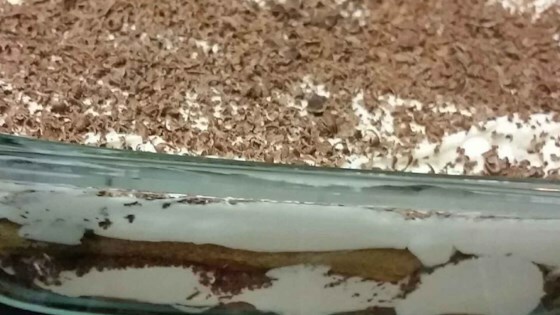 "Light, traditional-tasting tiramisu. Cognac can be substituted for amaretto liqueur. Dark coffee can be substituted for espresso." Whisk mascarpone cheese, sugar, and amaretto liqueur together in a bowl until smooth. Beat cream in a glass or metal bowl until soft peaks form. Lift your beater or whisk straight up: whipped cream will form soft mounds rather than a sharp peak. Fold whipped cream into mascarpone mixture. Pour espresso into a bowl. Dip ladyfingers into espresso and arrange 12 dipped ladyfingers in an 8-inch square pan. Spread 1/2 the mascarpone mixture over ladyfingers. Grate 1 chocolate square over mascarpone layer. Repeat a second layer with remaining dipped ladyfingers, mascarpone mixture, and chocolate, respectively. Refrigerate tiramisu until set, at least 2 hours. A true classic! Coffee-dipped ladyfingers and layers of luxurious creaminess. Loved this recipe! It's simple n fast. Best part is that no eggs! So good, we loved it! I only needed 1 oz of chocolate. I think I would've preferred cocoa powder overall though. Will definitely make again, thanks for sharing! Recipe was easy to follow. I sprinkled cocoa over the entire top quite liberally, giving it a great presentation. Decadent. I will definitely make it again.